Fall is fantastic – get out there and enjoy it! 18 Oct Fall is fantastic – get out there and enjoy it! Though deciduous trees capture most of my attention this time of year, it takes only a brief glance around my garden to realize that there are numerous shrubs that deserve equal billing for the brilliance of their fall color. Among my favorites are: smoke bush (Cotinus coggygria), witch hazel (Hamamelis virginiana), highbush blueberry, chokeberries (Aronia sp. ),Virginia sweetspire (Itea virginica), fothergilla (Fothergilla sp. ), and pretty much any viburnums. Look around your home landscape for these and other shrubs with fabulous fall color. If you don’t see many, it may be time to shop and plant some. With cooler soil temperatures and more abundant rainfall, fall is for planting! Celebrate the arrival of fall this week by strolling through a public garden! Tower Hill Botanical Garden is just a short drive away and you’ll be surprised at the large number of perennials still in glorious bloom. These include: false sunflowers, fall asters, fall crocus, Russian sage, Japanese anemone, sedums, and hardy chrysanthemums. Make a note to add any of these which are missing in your gardens to your shopping list. It’s time to start fall cleaning. Begin in the flower garden by cutting back the diseased leafy stems of perennials. We really hope you enjoyed last weeks blog with our how to’s of cutting back perennials. If you can’t find it, go to the Blog section of our website and it’s archived there. While you’ve got your trusty pruners out, cut off your annuals at ground level rather than pulling them out of the ground. Roots left in the ground will decompose and contribute some organic matter to the soil. Spot treat weeds in lawns. This is a good time for weed control, but don’t broadcast herbicides unnecessarily. If weeds are few, direct the spray onto the weed itself rather than over the entire lawn. Stop in and talk to us about the many new options in natural and organic weed controls. Perennial weeds will take advantage of the winter months to grow bigger, deeper roots and now is the best time to pull or spray them. If there are too many weeds for spot treating, consider cultural methods for weed control such as using a higher cutting height and maintaining good soil nutrition. Or you can copy what my brother Russ does and just start referring to that area of mixed plant life as your meadow. A meadow is now socially acceptable. Do you have some roses that you would like to have survive the upcoming winter, if at all possible, and particularly if new plantings? Or, are you one of those who had roses going into last winter, only to have many die while those of your neighbor lived? If either of these fits, you should consider mulching this fall. Most modern roses are grafted onto a hardier wild rose “understock.” Where they meet—the graft union– is the swollen area you can find at the base of many rose plants. It is often tender and susceptible to winter injury, and so needs some extra protection. A mulch will not only keep the soil warmer than unmulched soil, but also will prevent rapid fluctuations in soil temperatures which lead to soil heaving. Snow is the best mulch but, as we know, can not always be counted on. I use a seed free mulching straw that is available at the garden center. This mulching straw has a natural tackifier on it that helps to clump the straw together and prevents it from blowing all over my yard during the winter. A good mulch will settle lightly on the soil surface without excessive packing (this rules out most oak leaves) and cause no harmful effects (such as from diseases or weed seeds), Mulches derived from plants also add organic matter to the soil. Examples of good organic mulches are weed-free straw (not hay, which is weedy), dried leaves, bark mulch, or wood chips. Mulches should be piled at least a foot deep around plants, and not before mid-November, as roses need cool fall temperatures to develop some winter hardiness. Mulch much later and you may have to contend with snow first, and valuable ground heat will have been lost. Before mulching or mounding roses in mid to late November, finish your fall cleanup first. Remove all plant debris including spotted and diseased leaves. Pruning shrub roses like Knock Out and O-so-Easy down to about 18” in height. You can wait to prune in the spring, but doing it now will make the plant much easier to mulch. Even with protection, canes may have some dieback and need further pruning in the spring. With the cool nights all evergreens, including broadleaf evergreens such as rhododendrons, start to show fall shedding on the interior of the plant. This is very natural and occurs on mature growth only. With rhododendrons, you’ll notice the interior leaves will yellow and then drop. Usually fall shedding is heavier on newly installed or transplanted evergreens. From year to year the shedding can vary from little to a lot. Needle drop is not an indication that the plant is unhealthy. Now is also the ideal time to start thinking about what will fill all your (now likely empty) containers this winter. Here are a few shrubs that will help keep the show going straight into spring. In spring either leave potted for summer interest or plant in the ground. 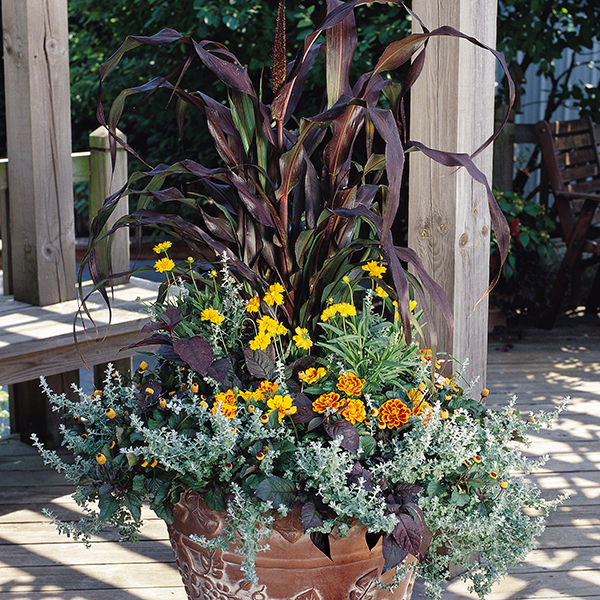 Tip–Be sure to keep watering containers right up to the first frost. An application of an anti-desiccant like Wilt Stop will go a long way in helping protect container evergreens from winter damage. If possible place planted containers in a sheltered location where they can be protected from high winds or heavy snow loads. Finally, try to remember to rotate containers at least once a month so they get sun on all sides. If you are looking for some unusual fall inspiration, stop in and see us!